Taste some local dishes accompanied by some great local wine. Red Wine Tour of Ronda, Andalusia. At 120 km to the south-east of Seville, Ronda is one of Andalucia´s most beautiful towns. It is famous throughout Spain for the gaping river gorge with a sheer drop of 120m which divides the medieval from the 18th century parts of the town. A spectacular bridge constructed in the 18th century spans the gorge and the view looking down from it is not for the faint-hearted! As well as the town being an obvious tourist attraction, the area around Ronda is becoming well-known among enthusiasts as a producer of very good red wines and to a smaller extent whites, which are being made in what are principally boutique wineries with every attention to detail. Grape varieties include Cabernet Sauvignon, Merlot, Tempranillo, Garnacha, Pinot Noir, Syrah, Cabernet Franc and Petit Verdot. The vineyards are at around 750 metres above sea level, a necessary requisite for making high quality tables wines so far south in Spain. We will be visiting three of the recently established wineries where the winemakers will be showing us around and sharing their incredible enthusiasm with us. When you taste their wines youll realize why they are so upbeat and why they think that although production in the area is small Ronda is going to become hallmark for fine wines. We will be having lunch at a fine local restaurant sampling local dishes accompanied (obviously!) by some great local wine. You will then have time to explore the wonderful town of Ronda town with its Moorish and Christian legacy as well as taking in some superb views of the surrounding mountain ranges and of course the plunging gorge. We will then head back to Seville after a very full day. Lunch at a fine local restaurant sampling local dishes accompanied by some great local wine. 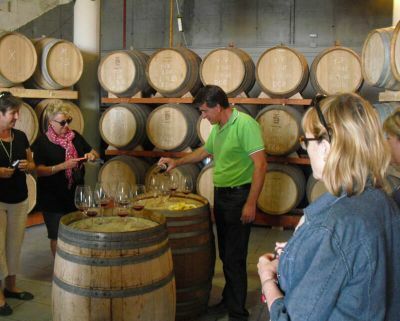 Selected winery tours & tastings.